During my 8th month of pregnancy in Kerala, I read about breast feeding on the job with the help of breast pumps. I loved the idea as I was already planning to resume my job once my maternity leave was consumed. I bought the breast pump and used it until Anshika was 10 months. In this post I will be writing in detail about my experience of expressing breast milk, feeding and storage in the form of questions and answers. 1. What are the two types of breast pumps available in the market? Manual and electric breast pumps are available in the market of various brands. Electric ones could be on the higher side of cost compared to manual breast pumps. 2. Which breast pump did you use and why? I used Medela Mini Electric breast pump as I wanted to go for an electric breast pump. Medela Mini electric could work on both battery and DC mains, produced less motor noise and is compact ; perfect for a working mom. Medela Mini Electric also came with a set of all breast milk expression accessories like sterilisation set, milk storage pouches, 4 sturdy feeding or storage bottles and insulated cooler bag. You can read my review of Medela Mini Electric breast pump. 3. Should I go for manual or electric breast pump? Depends on how many times you wish to express and your budget. I have heard good reviews of both manual and electric breast pumps. 4. What was your breast milk expression schedule? The method is to express as and when you can, freeze it and thaw it when it is about to be fed to the baby. 5. How to store expressed breast milk? Expressed breast milk was stored in medela bottles and kept in the freezer. Breast milk should be stored in the refrigerator right after it is expressed. Once the breast milk is expressed, I used to label the bottles with the number, date and time of expression before storing it in the freezer. 6. How much breast milk can I store in a bottle? Breast milk expands when frozen just like water. Hence it’s ideal to leave a gap of 1 ounce at the top while storing breast milk in bottles. Same is the case with storage pouches. 7. How about reheating of breast milk? I never used to give the expressed milk at home; it was confined to the day care only. Breastfeeding while at home and expressing as per the schedule helped to sustain or even increase the breast milk. Just warming the breast milk is required. Do not allow the breast milk to boil on stove as the nutrients would be lost. Warm about 2 cups of water in a wide pan and immerse the storage bottle in it. Let the bottle be warmed up to the room temperature. Then feed it to your baby using a bottle or spoon katori. 8. Did you feel any side effects of the breast pump? No, Infact I felt that the breast pumps helped me in increasing my breast milk supply. Our body produces breast milk on the demand and supply method. The sucking action of the breast pump imitates the natural sucking action of a baby. 9. How to save / dump the used expressed breast milk? If the milk remains after feeding the baby, discard it. Thawed milk, but not fed to baby can be stored in the refrigerator for a day (24 hours). If you choose to keep the expressed breast milk in refrigerator, transfer to a freezer to avoid odours picked up from vegetables and other food items stored in the refrigerator. 10. What all you did to increase breast milk production? I had a glass of juice / water before expression of breast milk. It helps in hydrating the body. You can read about the foods that could increase breast milk production. 11. 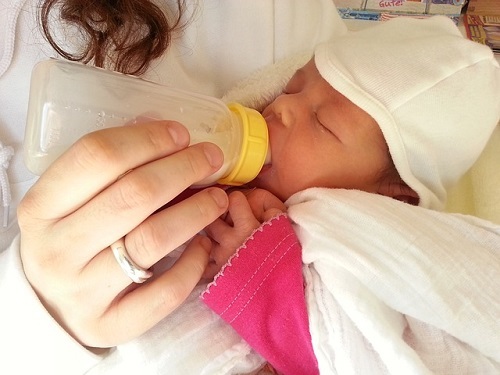 How did you feed the expressed breast milk to your baby? The breast milk bottles are kept in the freezer in the day care until Anshika wakes up. Then the breast milk is thawed and later warmed up. NO microwaves should be used in the warming up of breast milk as it could cause ‘hot spots’ which results in scalding. Anshika didn’t like bottle feeding. Hence the warmed milk was fed using spoon and katori. 12. Should I sterilise the breast pump every day? Yes every time after expression of breast milk to prevent bacterial growth in the breast pump. Sterilise the required parts with warm water and mild cleansing agent. Air dry and keep it in a compact box/ container. I guess I have covered almost everything about my expressing breast milk, my schedule, storage and feeding. If I have missed anything out, feel free to ask me in comments. You can also subscribe to the newsletters of Bumps n Baby to stay updated. Please share the article in your Facebook or twitter profiles too. Sangeetha is the owner of Bumps n Baby and a super cool mom of a 4 year old princess. Her life revolves around laptop and kitchen these days as she is mastering the art of multi-tasking. You can express enough during night and keep it as reserve for the next day at house. Also keep on reserving whenever you can this will help in case of emergencies. Formula is not really required if you have enough milk supply. will help me a lot as i will resume work from next month when my baby will b 5 months old. just wanted to ask if sterelizing is not possible what is its alternative. coz in office sterelizing is not possible. Priyanka, there are disposable steriliser packs available online. You can buy them . I used the sterilizer packs by Medela. My daughter is just 8 months old.. i stopped breast feeding her from 4th month as i started to work. i am putting on lots of weight it is because i am not feeding?? 2). as i am having gastric problem, i suffer with horrible stomach pain so i take lots of tablets (Rantac, pudinara, etc etc), it should not affect her. Presilla , Not breastfeeding cant be the reason for putting on weight.. Can you tell me more about your day to day routine, your nature of job, food habits etc.. I can help you .. First thing you have to is get a blood test done and show it to your gyno. Check your thyroid levels, Vitmain D levels, iron and blood count.. Let me know the results too..